Anjali Kirpalani is a twenty-five year old dreamer. Like the protagonist of her debut novel, Never say Never, she is 5' 2 and has frizzy hair but has never fallen for her best friend's boyfriend (even if she has, she promises she's never done anything about it!) Born in India, she lived in South Africa for 8 years and finally came back to Mumbai in 2008. She has had various jobs ranging from radio jockeying, business management, marketing, TV reporting, print journalism and voice-over artistry. Currently working with ET NOW, writing has been the one constant in her life. She grabs any opportunity she can to travel (this passion has led her to fifteen countries so far and she aims to cover the entire world) She also loves reading, eating and watching back-to-back episodes of Master chef Australia as a guilty pleasure. She can be reached on anjk87@gmail.com and followed on @AnjaliKir on Twitter. When I got a message from Miss Anjali Kirpalani in my blog's FB page, asking whether I'd like to review her book, I jumped at the opportunity. I'd seen the book being promoted and wondered what it could be about. Even as I write this review The Fray's Never Say Never is playing in my head...Anjali had already told me that the book had nothing to do with the song. It doesn't, but it does share theme - "you can never say never". For most, this novel would be written off as one which tells the tale of a young unemployed girl, Nikita, who feels utterly lost in life. 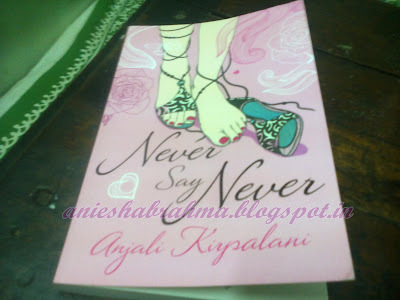 Anjali adds to her protagonist's misery by forcing her into a relationship with a guy, Deepak, she does not even like. To make matters worse, Nikita has secretly fallen for her best friend, Aziza's boyfriend, Raghav.... Wow! Talk about having one complicated life, or lack thereof. While I understand why most of my friend's would not pick this book up, I can understand why others would indeed like to give this a shot. Especially girls of our age, fresh out of college and have landed in the middle of the confusion called life. Being out of college myself, (pursuing an MPhil degree because honestly, I don't know what I want to do next), I could connect with Nikita. That is where Anjali hits the right chord - she draws the reader into Nikita's world, and makes you go through an amazing journey with her, wondering what the crazy girl would do next. In a time when everyone expects you to do the right thing, it's kind of comforting to find a book, where the protagonist gets everything wrong...right from her choice in lifestyle to her taste in men. Another reason which made me like the novel was the character of Siddhart...he's funny, smart and the right amount of annoying. Never Say Never points out that even in our darkest of days, we have the nicest of friends to brighten up our lives...but maybe sometimes we're just to blind to notice it. For a debut novel, Anjali Kirpalani has done a wonderful job, the read was light and breezy...and though we know how the story will end (Aristotle's rule - order will always be restored in the end), you cannot help finishing the book, just to find out if your guess was correct. I'm glad that I got to review Anjali's first book, and here's hoping I'll be reviewing her future books as well. For now, you can buy Never Say Never here.